I saw a headline a couple of weeks ago that declared the movie star dead. That proclamation was based on the disappointing box office opening of this film. Jennifer Lawrence and Chris Pratt have had great success in films in the last few years. Lawrence has arguably been the most bankable star, man or woman, since the start of the Hunger Games series, and Pratt starred in the colossus “Jurassic World” and “Guardians of the Galaxy”. Their pairing may have been the reason this film finally got a greenlight after years in development hell. The lower than expected returns are supposedly an indicator that star power can”t save a movie. The truth is, a movie succeeds or fails for many reasons, and while the star may be one of those reasons, there are usually others. The weakness of this films performance should not be unjustly laid at the feet of the two leads. 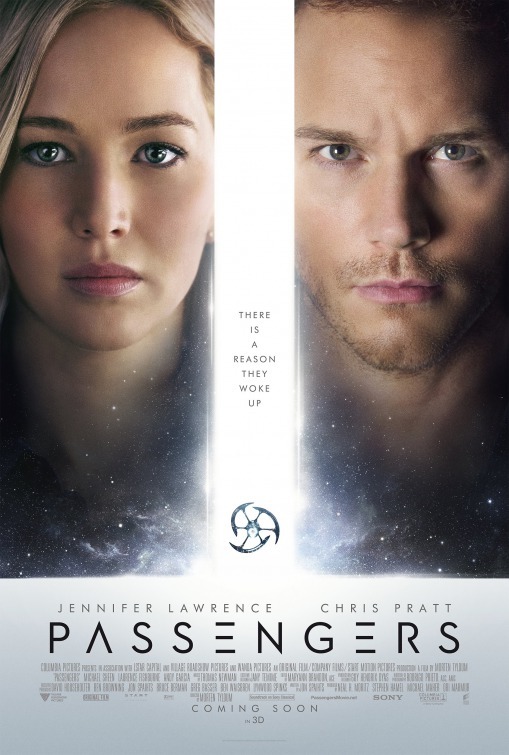 “Passengers” is sold to us as a love story in space. The trailers make the film look like an adventure with the star crossed lovers battling to save themselves and the ship they are traveling on. I’m going to avoid spoilers as usual, but I will say that there is a twist in this story that is much darker and deeper than the film clips suggest. Maybe this is not a great movie, but it was better than I expected and the production values are top notch so I think I can recommend it to people who like science fiction and a lot of drama thrown in. The provocative part of the story occurs for reasons that audiences will understand but may be horrified by. There is an interesting “what would you do? question at the heart of the film. The follow up question of how to handle the choice that is made is less complex because the story takes a very traditional turn into action tension and drama. The second act of the film is where all of the real emotion is and when the story veers back to the usual plot points, there is less that is interesting about it. For the vast majority of the movie, the two leads are the sole human characters on the ship. Michael Sheen, who is great, does have a side part to play, but he essentially is a tool for exposition and philosophy to be engorged in out loud. Lawrence and Pratt have to sell the human elements. I thought their chemistry was solid and that they made a somewhat believable couple under the circumstances. The failure of this movie to connect with audiences may have more to do with marketing than anything else. The trailers and ads ignore the real conflict of the film entirely and focus on the romance and adventure. There is a hint of a secret plot but that is a red herring, every shot with Lawrence Fishburne and Andy Garcia in it is misleading to the audience. Garcia must have a fantastic agent to get billing and paid for his contribution to the film. I suspect there may have been more of the story that got trimmed, and in the long run that is probably best. 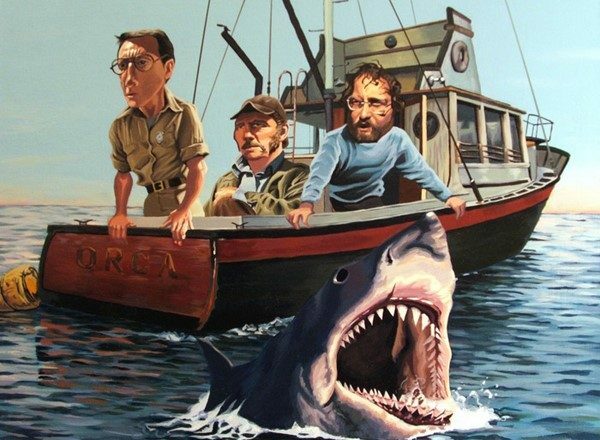 The appearance of Fishburne in the film, signals the start of the last section of the movie and a return to standard action adventure activity. The idea that a solo engineer and a well read but not expert passenger, can handle the issues that crop up is a little hard to swallow, but since the whole idea of the film is hard to swallow to begin with I guess I can live with it. The action beats are not surprising but the special effects work is solid and there is one final twist that does pay off from the earlier section. In essence it helps redeem the film and make it a bit more worthy. “Passengers” is not an essential film but it is entertaining and it should make for a good date night film for all those future “Netflix and Chill” evenings ahead. Now I’m curious to see this. BTW, love the new look of the blog. Happy New Year, Richard. Thanks, a little adjustment for a new year. The film is fine, if you wait you can catch up on video.